2019. 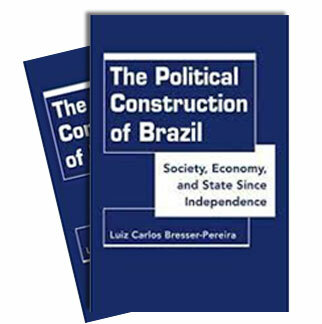 List of Bresser-Pereira's theoretical contributions and respective papers or books. .
2018. A retention or tax on the export of commodities will neutralize the Dutch disease and assure to the manufacturing industry equal conditions in the competion with other countries. The tax will not represent a buden to the exporters, because they receive back their money on the form of depreciation of the real. 2017. The Dutch disease is an economic problem that a simple economic policy may resolve, while the natural resource curse is a political-cultural problem very difficult to resolve. Paper presented in St. Petersburg. 2017. Presentation to Likhachov Scientific Conference in St.Petersburg, Russia. 2017. The Brazilian economy is quasi stagnant from 1990, because since the 1980s it dos not have public savings to finance public investments, and because, since 1990, it is caught in a high interest rate-overvalued currency trap that makes the competent industrial firms not competitive and unable to invest. 2015. Pre-industrial countries are supposed to realize their capitalist revolution in a global political famework that requires that they are democratic. But today's rich and middle income countries made it while their regimes was authoritarian. (Texto para Discussão EESP/FGV n.410, january 2016). Publicado no Brazilian Journal of Political Economy. 2015. New Developmentalism is a theory that was preceded by Classical Developmentalism. It focus on the equilibrium of five macroeconomic prices, and of the two macro accounts, particularly the current or external account. 2014. With Eliane Araújo e Paulo Gala. Econometric comprovation of a high rate of substituition of foreign for domestic savings. 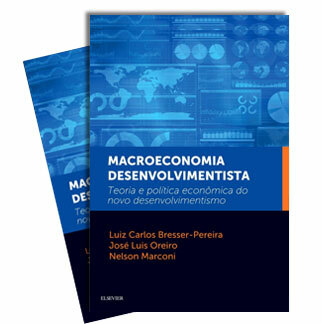 (Paper: Revista EconomiA) Portuguese version available. 2014. Progress was associated with the advance of reason, development with the fulfillment of the five political objectives that modern societies set for themselves: security, freedom, economic well-being, social justice and protection of the environment. (Paper in edited book). 2012, with Daniela Theuer. Improved version of Um Estado novo-desenvolvimentista na América Latina?. Published also in French Amérique Latine : après les années néolibérales, l'État développementiste est-il de retour? 2012. There are three models of developed capitalism (liberal-democractic or Anglo-Saxon, social or European model, and Japanese model and two models of developing capitalism: the Asian developmental model and the liberal-dependent model. (Paper: Revista de Economia Política). Portuguese version available. 2011. The core of neoclassical economics (general equilibrium and rational expectations macroeconomics) is demoralized. A Keynesian-structuralist alternative is available. What is necessary to do to become mainstream again. Portuguese version available. Also available a Slide presentation. 2012. Paper presented to the annual meeting of the Association for Evolutionary Economics (AFEE), receiving the James Street Scholar for 2012. Chicago, January 7, 2012. (Journal of Economic Issues). 2011. My more complete paper on new developmentalism. In José Antonio Ocampo and Jaime Ros, eds. Handbook of Latin America Economics, Oxford: Oxford University Press. (Paper). Portuguese version available. Why did democracy become consolidated only in the twentieth century? 2011. (Paper) The final version of this paper is Democracy and capitalist revolution,but I decided to conserve this earlier version. 2010. The 2008 financial crisis signaled the end of 30 Neoliberal Years of Capitalism. It was caused by the deregulation promoted by the neoliberal ideology justified "scientifically" by neoclassical economics. Paper (Revue de la Régulation). 2010. Democratization is the improvement of the quality of democracy. Besides reduction of political inequality, it requires reduction of economic inequality. (Paper for the Festschrift of José Maria Maravall). Why inequality does not fall? 2010. With Marcio Holland. Latin America integration, particularly Mercorsul, would be strengthened if there was a common currency. We should work on this direction. (Paper : Journal of Post Keynesian Economics. The global financial crisis and a new capitalism? 2009. Neoliberalism and its "scientific" justification, neoclassical economics, were more than just an assault on the state it was also an assault to the market. (Essay: Estudos Avançados). A slightly modified version, "Economics: an assault on the state", has been published in Challenge, 53 (5), September 2010: 57-77. 2008. Neoclassical economists use the hipothetical deductive method, but an empirical-deductive method, particularly the new historical facts approach, is a a more advisable aternative. (Paper: Journal of Post Keynesian Economics). Portuguese version available. 2009. Over-exploitation as well as associated dependency interpretations denied the possibility of national bourgeoisies in the region and contributed to weakening Latin American nations. Only a third version of dependency - the national-dependent interpretation - escaped this fate. Published in English in Latin American Perspectives 178, vol. 38 (3) May 2011Portuguese and French versions available. (Paper: Latin American Perspectives). 2007. With Cleomar Gomes. The paper claimsthat inflation targeting policy was adopted in Brazil before the interest rate trap was faced and solved. This was a mistake because inflation targeting is good to manage monetary policy, not to change the monetary regime as it was in 1999 and still is necessary in Brazil. (Paper in edited book). Portuguese version available. 2008. Economic growth is the outcome of a national strategy of development. The characteristics and main tensions involved in these national strategies discussed. Improved English version of a paper previously published in Portuguese.